Marketa Uhlirova: What was on your mind as you began to conceptualise this exhibition? Alistair O’Neill: From the outset it was important to think through what had already been staged and published about Bourdin. It has been eleven years since the V&A staged the first UK survey of Bourdin’s work and since then, an appreciation of his work has grown, as has its position within contemporary visual culture. In 2003, Bourdin was still regarded as a photographer’s photographer, or a photographer with cult interest but now his work is seen in a wider context, partly due to how it is celebrated in an expanded field through books and exhibitions, but also due to how fashion photography now functions in a digitally driven image culture. MU: Was it a challenge to present Bourdin’s work differently from all the previous exhibitions and book projects dedicated to him? AON: The main reason for me wanting to get involved in this exhibition was the chance to reconsider Bourdin in the light of new material recently released by the estate, allowing us to offer a new account. Usually this kind of project is staged in order to resurrect the profile of a creative, or to build a reputation. In terms of Bourdin, by staging this exhibition we are only confirming a growing interest in his work, which is evident in terms of the response we have had to the exhibition and the range of contributors who wanted to write for the catalogue. You don’t usually get this kind of reaction and I take this to be a testament to the way people invested in photography and film still regard Bourdin. MU: Don’t you think it’s ironic there is this hunger to revisit Bourdin’s work given that he himself wasn’t so keen for his work to be taken out of the context of the magazine? AON: There certainly exists an idea that Bourdin didn’t care for the legacy of his work. I also believed this – it was a very powerful narrative to rediscovering his work in the 90s. I remember the idea being raised in the BBC documentary aired in 1996, and in the Bourdin special issue of Dutch magazine in 1997. But let me try to unpack this notion a little. I do think it is true that Bourdin wasn’t motivated in seeing his work in a one-man show or monograph terms during his lifetime, in contrast to the likes of Newton or Avedon, say. But the idea that he didn’t care for his archive I now think is untrue. Yes, he might not have looked after it according to museum conservation standards, but then, very few photographers did at that time. But he did care about the work bearing relevant to a future generation of creatives. This is a different approach to legacy, as it isn’t bound to a self-imposed form of status or recognition. Bourdin was simply not interested in being known as a named photographer, he was far too private a man for that and his interests lay elsewhere. I certainly do hope that the exhibition can help shed the idea of him not caring about his work. AON: I think that back then, the parameters of what constituted art photography, certainly within a museum or gallery context, were much more limited. Bourdin chose to ignore this as he had decided to work within a commercial medium that actually resonated in the 70s in a way that was perhaps more progressive than hanging photographs on walls. Bourdin was an artist first before being known as a fashion photographer and was lauded in his first career as a protégé of Man Ray. In this, he understood the power and affect of commercial imagery, as something that can operate alongside a personal portfolio of work. 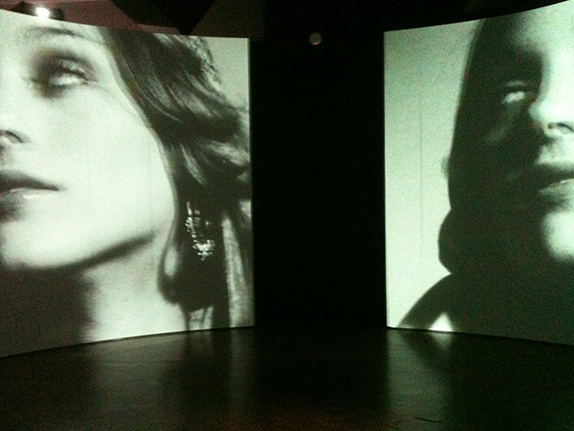 MU: The exhibition has a whole room dedicated to Bourdin’s films, and more. Some of them we already know from an edit SHOWstudio made back in 2003, in conjunction with the V&A show. But you returned to the original reels, didn’t you? What is the nature of these films as far as you see them? AON: The films are spoken of as proto fashion films, in terms of how we now categorise commercial moving imagery employed by fashion brands and fashion content providers online. However, Bourdin didn’t make these films for commercial ends, they may have been made alongside a shoot for photographic editorial or advertising (as is the case with so many fashion campaigns today), but they were for Bourdin’s own interests and not for broadcast or for any kind of gain. MU: Tell me more about how you see the films within the larger body of Bourdin’s work. AON: The films can be divided into two types: one, which is rapid edit, composed ‘in camera’, without any post-production splicing. They operate as a kind of stream of consciousness and connect to techniques of filmmaking rehearsed by American underground film in the 1960s. As an approach it is free-form but also highly specific to Bourdin’s viewpoint. The second is really much slower in form, and lingers on an established pose, intended to be shot for a still image, but which has a repetitive sense of movement in it. The shot is long and unchanging and fixed in point, and it revels in the slow, undulating form of movement. While the former is linked to a documentary tradition, the latter is studio, process-driven observation. Both help to inform an understanding of Bourdin’s photographs. MU: Yes, and since you mentioned the American underground in case of the former, I would say that many of the elements present in the latter – the exploration of the act of posing for the camera, the tension between photographic stillness and filmic motion, the interest in process and repetition – have a Warholian resonance about them, even though they are clearly much less programmatic and have a different aesthetic. But there is another point in which Bourdin’s films remind me of Warhol’s (and Jack Smith’s for that matter) – it is that interest in film as a device of slow scrutiny and what you just called process-driven observation. I like the way he repurposed film and filmmaking practice for his own agenda, with an uncertain outcome. How much do we know of his motivations to create these bits of moving image footage? AON: We don’t, sadly. We do know that he used 16mm, 8mm, Super 8 and Polavision. So although working in a commercial capacity as a professional photographer, he tended to prefer using amateur filmmaking technology. This is of note, to me in any case. Guy Bourdin: Image Maker is on at Somerset House, 27 November 2014 – 15 March 2015. The exhibition is curated by Alistair O’Neill and Shelly Verthime.